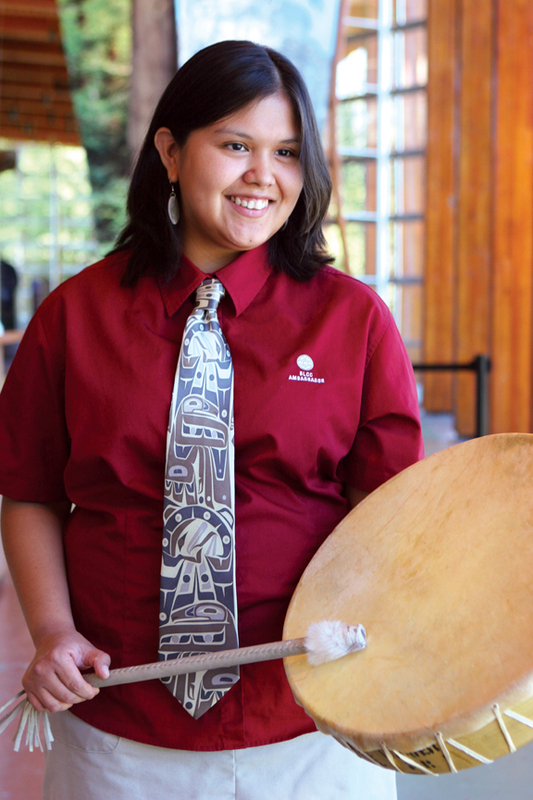 Although overcoming shyness was a key motivating factor for joining the Aboriginal Youth Ambassador Program, twenty-four year old Roxy Lewis has spoken to over fifteen thousand people in the past year alone at the Squamish Lílwat Cultural Centre in Whistler. She speaks with a moving combination of strength, openness and humility, asserting herself as a true Ambassador for the aboriginal community. Roxy Lewis commutes an hour each day to work as an Aboriginal Youth Ambassador at the Squamish Lílwat Cultural Centre, in order to be a leader. “My community is calling upon me to do a lot more work, especially the more I participate within this role in the Aboriginal Youth Ambassadors. They’re calling upon me to participate in a lot of things, especially with the Olympics coming up,” says Lewis. Lewis was raised with Squamish Nation culture since she was seven. She was surprised to discover just how much cultural information she already knew when she entered the program in 2004, compared to some of the other participants. While she is forward-looking, she also recognizes that the abuse and cultural suppression that her parents’ generation faced in residential schools is largely responsible for this gap in cultural knowledge. “My family doesn’t really talk about the past, so once they do I’m like a sponge and constantly ask questions,” says Lewis. With the help of AYAP, Lewis’s curious initiative is helping to fill this gap. “We’re still here, we’re still alive, we still have our culture. We did not live in igloos or teepees. We did not have totem poles, we had house posts and welcome figures,” she says. In addition to working as a mentor for AYAP, Lewis is also team leader for admissions at the centre and in her spare time is involved in an aboriginal dance group.